American Mystery Box is a monthly subscription box filled with Made in America products. Each month, they send you items made in USA that have a warranty or lifetime guarantee, including things like food and treats from different cities and useful items for your home or for outdoors. 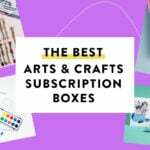 They offer four subscription options: the Original Box, a Kid’s Box (for ages 5+), a Family Box (which is a mixture of the Original Box and the Kid’s Box) or an Original + Doggie Box. Every American Mystery Box comes with an informational card, detailing every item included in the box. This parchment paper is made in Dallas, Texas and is unbleached and 100% plant-based. I don’t bake often, and I actually didn’t have any parchment paper! I’m looking forward to trying to bake more this holiday season with this – no more scrubbing pans for me! This cookie sheet feels like a great quality and isn’t a very large size, which is perfect for my little 2-person household. Smoked chocolate chips are something I have never heard of – these are apparently made by being smoked slowly for 10 hours over alderwood. I’m always excited to try gourmet chocolates, but these are just not for me – probably because I don’t care for the smoke flavor in general. These will be swapped! This is a really nice cookie cutter, and I love that it has a handle on top! Verdict: Overall, I enjoyed the November American Mystery Box. I thought the themes was perfect for the holidays and I’ll use most of the items. The value for this box comes out to $47.38 – while I really liked the box itself, I wish it had a higher value. I know there’s something to be said for the sourcing of only USA-made items, so some people may see that having a value of its own (personally, though, I’d still prefer to see a little more out of a $59/month box). What do you think about the November American Mystery box? Hi Haley. We listened. The monthly subscription has been lowered to $44.95 which INCLUDES $10-$12 shipping cost. Once item included was a favorite of Frank Sinatra. I would consider signing up for this box if it was in the $30-35 price range, but ~$60 for >$50? By my math, you’re better off waiting for the spoilers and recreating the box on your own. None of the items seem difficult to find. Shame because I really like this sub’s concept (Made in USA). I love parchment paper 🙂 I almost cried when I saw the cookie cutter. I grew up with a similar type of cookie cutter with a handle. We used them every Christmas to make sugar cookies. I want to know if anyone uses the tattoos that comes in sub boxes. I love parchment paper. I always have some around. But I just buy whatever kind is on sale at Target. Now I never have to wash cookie sheets and my layer cakes never stick to the pan (cut out a circle of parchment paper and put it in the bottom of the pan, but also spray with cooking spray). That being said, I don’t like the smoke flavor either and I have equivalents of most of this stuff already, simply because I bake all the time (and I won’t wear temporary tattoos). So this box is probably not for me. I like how there was one cohesive theme. The box basically sets you up to create chocolate chip snowflake cookies with sprinkles. Are you’re missing is the cookie dough. This box looks really awesome, but not for $60. I could go to my local cooking store and get full size cookie sheet, cookie cutter, and food items for under $60.